Becca helps employers proactively manage their workforce issues to help them reduce their risk and improve the productivity of their workforce. 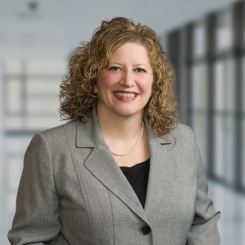 She focuses her practice on defending and managing workers’ compensation claims, including allegations of violations of specific safety rules and permanent total disability claims. What was the single most important thing that made you want to focus on labor law? I enjoy practicing employment law as it provides me an opportunity to truly get an understanding of how my clients relate to their employees and operate their businesses. I have the opportunity to not only litigate matters but also counsel my clients on how best to proceed and how to avoid litigation. I enjoy troubleshooting difficult situations, but also advising my clients on how to prevent potential liability. Practicing employment law provides an opportunity to advocate and advise. The best advice I have received and the same advice I pass along to younger attorneys is to remain true to your own style. Whether your style is to kill them with kindness or pound the table and shout, you cannot emulate a style that does not resonate with who you are. You will be most successful and be an effective advocate for your clients when you remain genuine to yourself. I admire Sandra Day O’Connor. I was fortunate enough to have lunch with her while I was in law school. What struck me the most that she did not view herself as a trailblazer, but rather just an attorney doing her best work. I think we should all always strive to be our best and provide the best service to our clients, whatever the circumstance. My favorite activity is to ride my bike in the parks. However, as I am about to give birth, I suspect my new favorite activity will be snuggling with and reading to my son. My theme song is “I will survive” by Gloria Gaynor. With a little bit of disco and dancing, you can get through anything!